Herbs provide flavor to foods, fragrances to cosmetics and household products, and are used as an ingredient to make some medicines. Even if you don’t have the space for a vegetable garden, it is possible to grow herbs indoors or in the patio or yard. 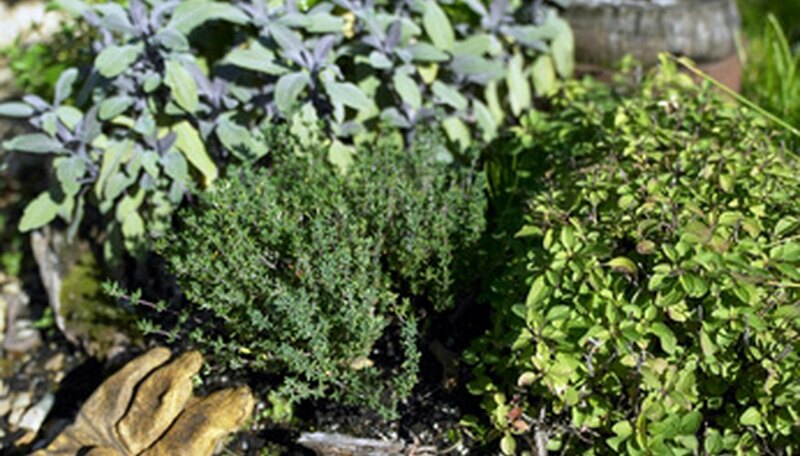 Low growing herbs are a good choice for container gardening or for growing along pathways. Oregano, also called marjoram, is a member of the mint family. Oregano is an herb commonly associated with Italian cooking. The distinctive and sharp flavor of oregano seasons stews, dressings and soups. Manufactures utilize its oils in soap making. Common oregano is low growing, while Greek oregano is upright and can reach about 2 feet in height. Thyme is a culinary herb, used to flavor stews and soups and as in ingredient when making a bouquet garni to flavor stock. Its oils are also used to make the drug, thymol. There are over 300 species of thyme, with some being low growing. The low growing varieties of thyme include: woolly thyme, miniature thyme, mother of thyme and caraway thyme. Mint makes an excellent ground cover because it is easy to grow and will quickly cover the area. Because it is an invasive plant, it might take over areas of your garden where you don’t want it to grow. Container gardening is one way to restrict the growth of mint, confining it to its own limited space. A spring of mint makes a delightful garnish for beverages and desserts. Mint varieties include peppermint, spearmint, pennyroyal and corsican mint. Pennyroyal is used as an insect repellent and shouldn’t be ingested. Ajuga is a low growing herb used as a ground cover. It effectively takes over an area, making it virtually impossible for the weeds to grow. The roots of the ajuga are used in making black dye for woolen products. The plant boasts blue-violet colored flowers during the springtime and attracts bees. Used as a substitute for lawn in parts of Europe, anthemis is an aromatic low growing herb which can be mowed and is drought resistant. The herb is sometime used to season sherry and is used in some hair products as an ingredient to soften the hair. While the plant is low growing, its flower stems will spike up about a foot tall.